Despite travelling through India a few times a year it never ceases to amaze me. The charm of cities where even the busy crowds and bustling chaos has something really interesting to add to the mix. There is method to the madness. Street food, fish markets and spice vendors all seem a familiar home ground for me, which is probably why I revel in it so much more. Regional food within communities cooked in homes across India, people that I meet along the way and food institutions with a long standing tradition. I travel to India a few times a year to explore the length and breadth of the sub continent yearning to cook and eat my way through cities. Find out about local ingredients, spices and markets. My visit to Delhi last month was a revelation as I cooked in local homes and also sampling food cooked by some of amazing talented food folk in the city. More on that next time! For me no visit to the city is complete without a trip to Old Delhi. Eating kebabs, parathas and kulchas through the tiny streets of Chandni Chowk remind me of when I was 11 and came to the city with my parents. 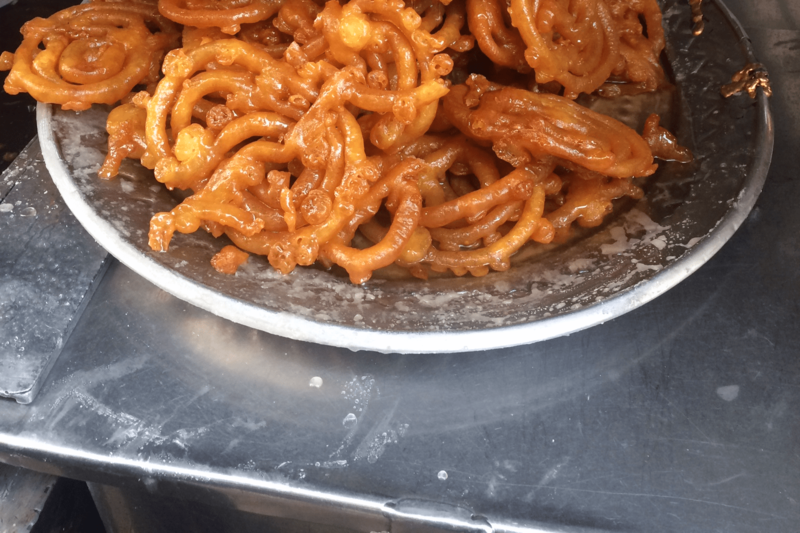 So as much as most of my friends rave about the Jalebis at Fatehpuri Chowk or anywhere else in the city; I really can’t resist visiting Old Famous Jalebiwala. The queues at the tiny little stall are there all day and for good reason. 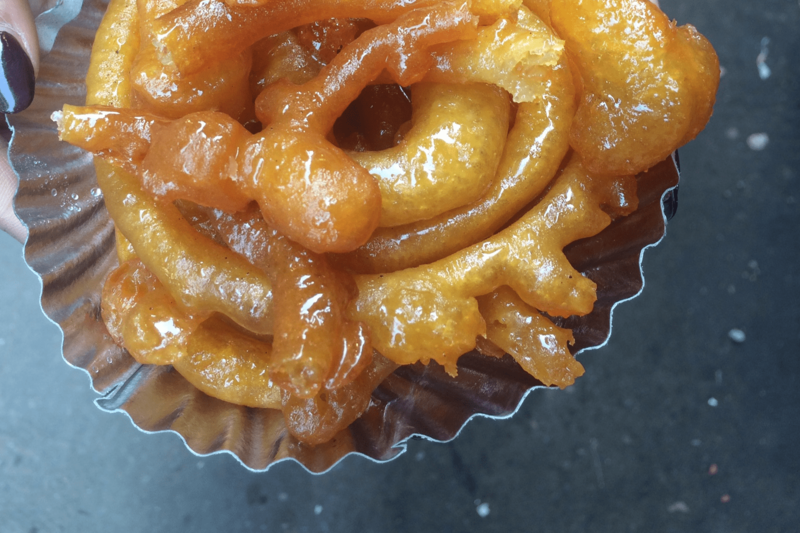 I have always preferred thin and crisp jalebis as they tend to be lighter and have a good crunch to bite into that sweetness. Though here I make an exception. The jalebis are quite big and yet moist. The shop has been running for over 80 years and you can even find people tucking into a plate of these at 10am! Old famous Jalebiwala cook the jalebis in desi ghee (deliciousness alert! 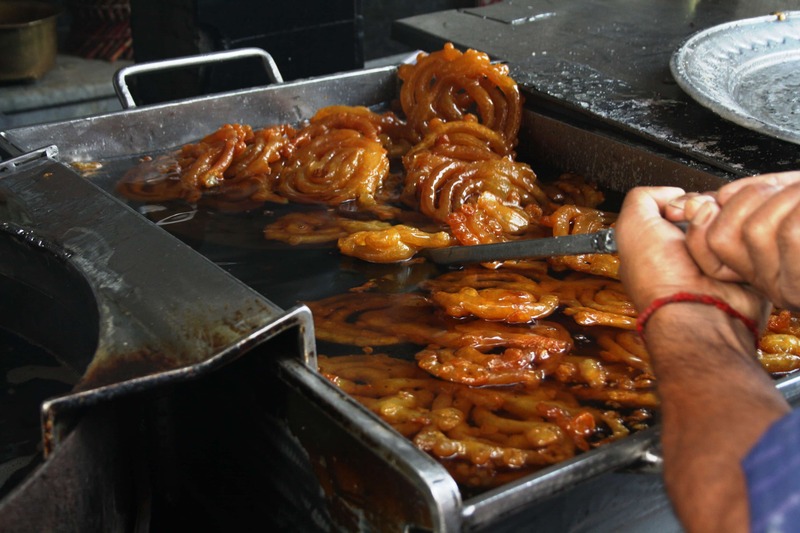 ), also once fried the jalebis are not soaked in sugar but in khand (or shakkar khand) an unrefined variety of raw sugar made from thickened sugarcane syrup. This doesn’t make the jalebi too sweet. We did have a few plates. 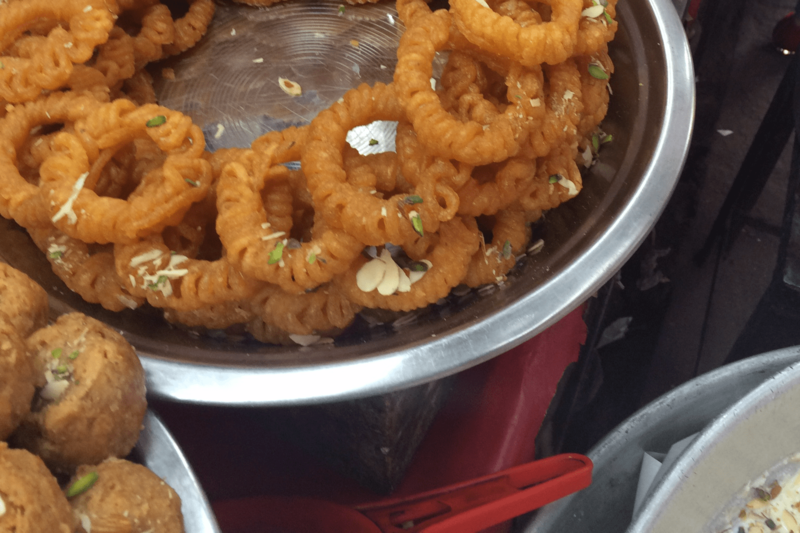 And despite the chunky pieces of jalebi they were light, with the right sweetness keeping us coming back for more.